RaisingPinoyBoys.com is the interactive website partner of the book Raising Pinoy Boys. You are all invited to share your thoughts, comments, stories, questions and other matters pertaining to the subject. This site aims to build a community of families gathering together to serve as effective support system in raising our Pinoy boys to their full potential. Rationally, we should make decisions based on the future value of investments, goods, services, and other choices in life. Well, that’s true for the “Econ” (the term used by Richard Thaler to refer to the rational individual always maximizing utility and minimizing costs in traditional Economic theories). But the human consumer is far from that. Our decisions are tainted with the emotional investments made in costs already incurred, regardless of what the current and future costs and benefits are. Because we have already put in something that cannot be retrieved anymore, we put more weight on it and stick with the original choice, consequently, foregoing other better options; hence, a fallacy or unsound decision. You bought stock A because of an expected growth in the industry and other favorable growth factors. A few months later, the stock lost 1/3 of its value because the factors you assumed in your projection did not materialize. Instead of cutting loss, you put in some more because you feel you can even buy more shares now. You are actually throwing good money after bad. You bought an insurance with investment component without much thought because you just wanted to help your insurance agent-friend. After realizing that you bought a product not suitable and in fact, expensive for your needs, and that you’re better off if you discontinue it and just do your own automated investment in low cost index funds plus a separate low cost term insurance, what do you do? You continue to pay the premium because you already paid two years of premium. Sayang naman. You started watching a movie in order to be entertained. Fifteen minutes into the movie and you feel it’s crappy and your blood pressure seems to be rising instead of being entertained. You continue watching it because you already paid the ticket and there was no way you could refund it. You started reading a book recommended by a friend. You finished two chapters but can’t get yourself interested. You keep at it because you already bought that pricey hard bound book and realize that you’ve already spent a couple of hours reading it. You belong to a family of doctors. On your third year proper, you feel that this is not your calling. You press on because you have already invested a good number of years studying Medicine. You have been working on your chosen career but feel like your yearning is in another field. You go on because you think it’s too late to change careers. You ordered too much food or you’re eating at an eat-all-you-can buffet. You’re now full but you continue to eat until you’re uncomfortably bloated, because you already paid the price. Bad marriage or exclusive relationship that goes on and on despite the obvious that it’s not doing the parties any good but harm. You stay in a bad relationship because you feel that you’ve already invested a good number of years and lots of emotions in it. Oftentimes, the people around you like well-meaning family and friends who have been involved in your romance also contribute to this sunk cost fallacy of keeping the relationship. A wedding doomed from the start. Once a friend confided shortly before the wedding day that he was having seconds thoughts about pushing through with his wedding. After a long discussion narrating their years as a couple, it was obvious that the wedding should not take place. He still decided to push through because of all the years spent together and the wedding preparations already completed and paid for, invitations already sent out. Kahiyaan na lang! Napasubo na! As expected, the marriage did not last. An example of sunk cost fallacy in epic proportions is the Concorde. In 1954 a committee was formed to study the supersonic transport concept. Originally formed among British aircraft and engine manufacturers and the government, France joined in 1962. The first supersonic airliner was already predicted to be a failure early on. By the time it made its first commercial flight on January 21, 1976, the enterprise was already plagued with prohibitive cost overruns but everyone involved kept going. Reasons or justifications used to go on with the project were to provide employment, to maintain technological expertise, etc., but it was primarily the shared psychological burden outweighing any rational judgment that kept the proponents going. They had already put in considerable time, effort and money (a lot of it was British and French taxpayers’ money) that they could not give up. It was only after decades when they finally threw in the towel with the last Concorde flight on October 24, 2003. They spent a total of 1.3 billion pounds sterling. With this (mis)adventure, the term Concorde effect or Concorde fallacy was coined to refer to the escalation of commitment resulting in an investment trap which is essentially throwing good money after bad. The developers of the online game Farmville know how to trigger the human addiction to investment due to sunk cost fallacy and loss aversion. Farmville is free. The first time you try you are transported to a world of farmlands where you are enticed to plant. You wait, then you will see the fruits of your effort – harvests, coins, etc. Unlike other games wherein you can just start where you left off, this one isn’t so. If you fail to return after a certain period of time, your investments will die! You won’t do that because you don’t want to waste the time, money and effort that you’ve already put in. But wait! There’s a way to stave off these negative feeling of losing, you can pay Farmville real money or participate in the offers of its advertisers. Some Farmville players even set alarms to wake up at certain times of the day just so their investments won’t die. I’ve heard some complaining, “Bwisit! Napupuyat ako sa Farmville na ‘yan!” (“Grr… I’m losing sleep over this Farmville!”). You can never get back the time and other resources wasted so you keep going. Somehow, you’re not playing to have fun anymore, but to avoid the negative emotions of losing. The sleepless nights caused by Farmville might not be as dangerous but imagine the harm that sunk cost fallacy can do to us. The individual examples enumerated above such as hopeless relationships, poor investments, getting fat, wasting time, stuck in a career, etc. can ruin our life. 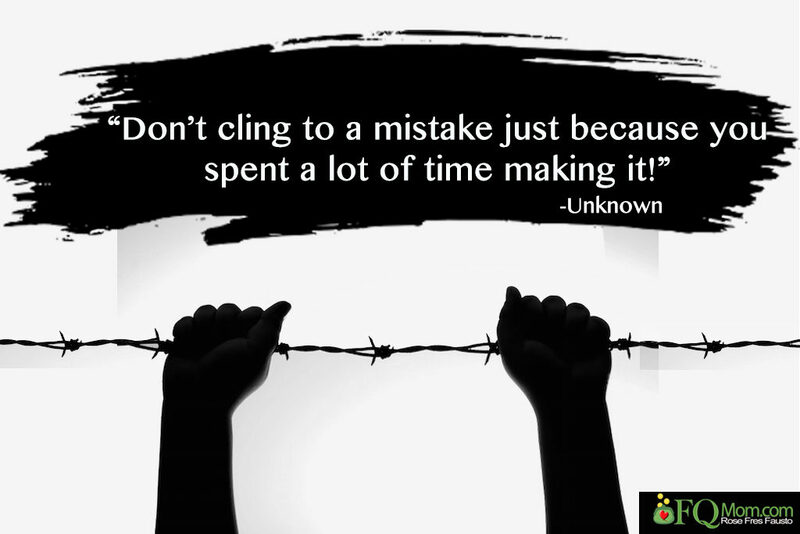 Moreover, sunk cost fallacy by our leaders and decision makers can affect whole nations and the entire wolrd. 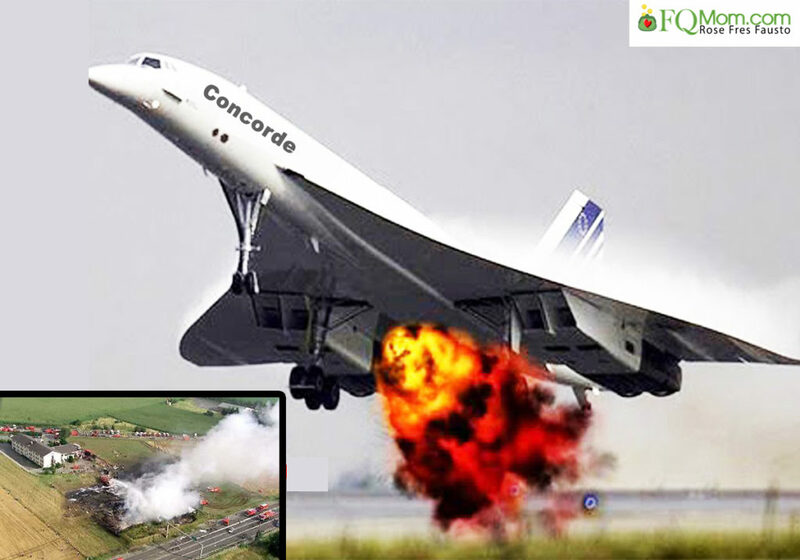 The Concorde effect took a big toll on British and French taxpayers’ money. 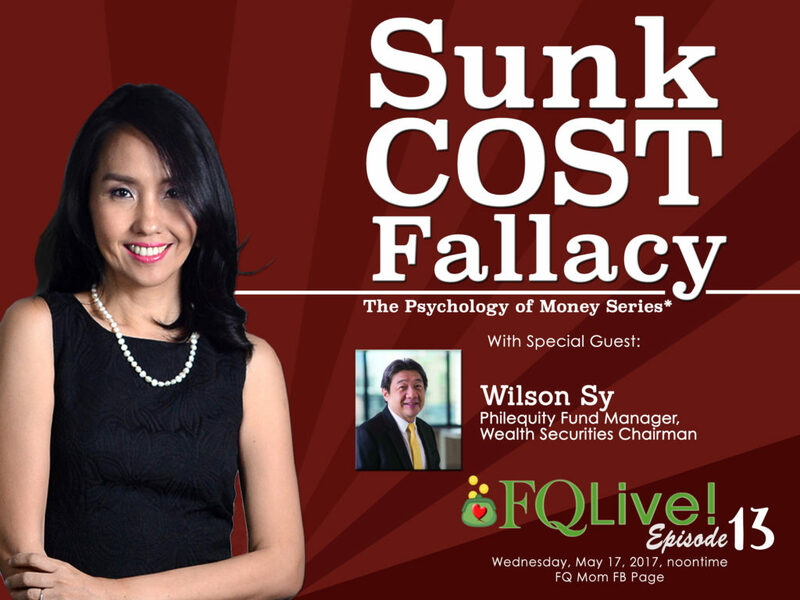 Sunk cost fallacy makes our leaders do irrational things such as go to war or continue being at war, keep failed policies and projects alive. Go through history and current events, they are happening all over. So do we give up on our course, career, marriage, stocks, book, movie, project, etc. right away? Don’t we always hear that success stories are made up of perseverance, of not giving up? The difference between healthy tenacity and sunk cost fallacy lies on how you would answer the question, “If I were to make that decision now, would I still make the same decision?” If your answer is yes, then by all means persevere at it; otherwise, it’s time to move on. 2. 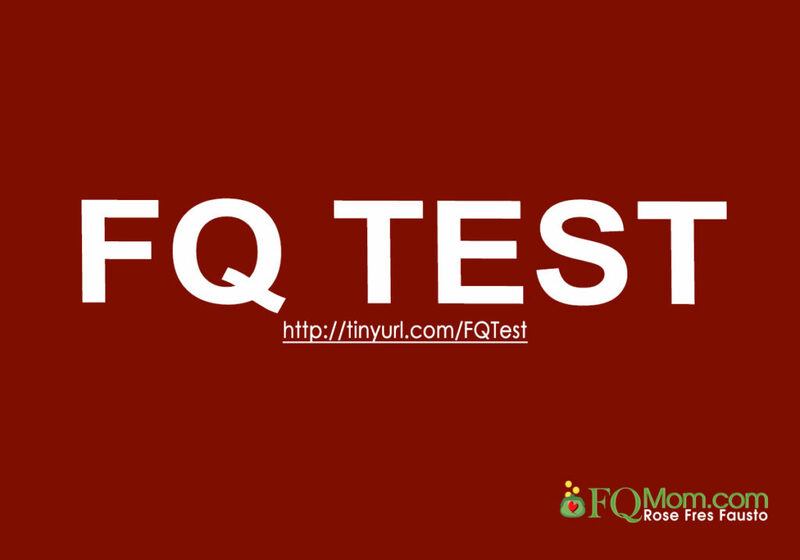 Want to know your FQ Score. Take it today. Click link to take the test. 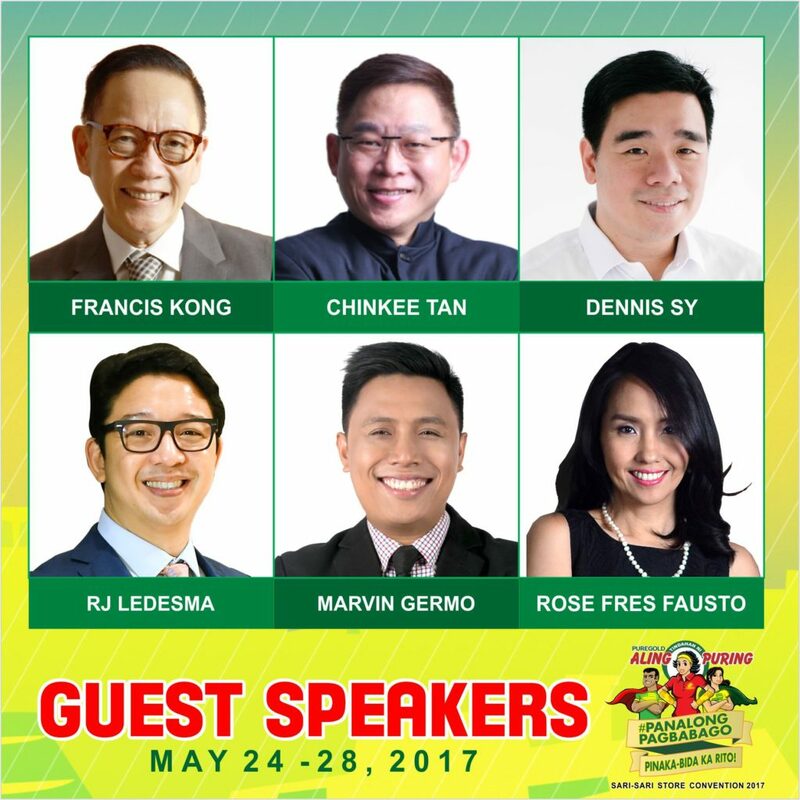 3.I will speak at the “12th Puregold-Tindahan ni Aling Puring Sari-sari Store Convention” with the theme #PanalongPagbabago to be held on May 25, 2017 (Thursday), 1:30-2:30pm at the World Trade Center, Manila. My topic is “Pagbabago sa Pananaw sa Pera.” Here are the other speakers. ATTRIBUTIONS: Images from 1001 Crash, Clipart Net, ClipartFest, Google Play, HF Plumbing & Heating, OnlyGFX.com, PNG Mart, www.prweek.com and YouTube put together to help deliver the message. To start a topic thread and ask the Raising Pinoy Boys community a question, please Sign Up. To Ask Rose or Her Boys a question go to the Ask Question Page. Hey Rose! Do you take sessions on Financial Literacy? If so, what do you cover in those sessions? Hi Ms. Rose, I read your articles in Philippine Star and I'm quite interested on your topics about financial literacy. I just turned 25 and currently working in Riyadh, I'd like to make my savings grow while I'm still young and single, can you give me advice on how or where is the wisest way to save or invest? Thanks a lot! God bless you! For the boys, will you also consider financial literacy as a quality that you will look for to your future gf/wife? It would be ideal if she were but it's not something we would really "require" so to speak because it's not very common. I guess as long as she's not too much of the "magastos" type because financial literacy is something that you could learn. @Guest Aug 30, 2011. The title is Raising Pinoy Boys because it's a compilation of a mother raising her Pinoy sons. Yes it's culture specific and middle class because that's where I belong. In my over 2 decades of parenting I have always learned a lot from specific stories of book authors, parenting seminar speakers and even conversations with other parents and educators of boys. Thus, I thought it would be worthwhile to share my specific stories and those of the parents of the successful Pinoy men I featured in the book. Thank you very much for your question. Can we invite you to talk in our school during a parenting seminar? @Guest Aug 10, 2011 - Yes you may. I would be glad to. Just send me an email specifying your needs for the talk - the audience, the topic, etc. You may send your email to RaisingPinoyBoys@yahoo.com or through this website. Be sure to leave your name and email address. Thank you. du u know chris tiu? I first heard of Chris Tiu when he became a UAAP basketball player of the Ateneo team. I learned about his other admirable traits later on and decided to include him in the book. Fortunately, his mom is a friend of my co-parent so I was able to interview her. He and his parents attended the book launch (see pics in a previous article on the book launch - Jan 2011).